Its is not very often you find a public golf course that is both picturesque and difficult. If you are looking for terrific Moorpark golf deals, you will be more than satisfied with Tierra Rejada Golf Club located in the heart of Ventura County in Southern California. This interesting course is approximately a 45 minute drive from downtown Los Angeles right off of Hwy 23. The course was designed by Robert E. Culp and was officially opened in 1999. The 18 hole course is carded as a par 72, covering 7,015 yards from the championship (black) tees. 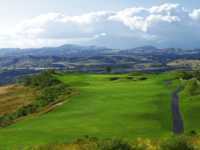 Tierra Rejada Golf Club has a course rating of 73.3 with a slope of 132 on Bermuda grass. The front nine is best described as radical with an array of sand traps, blind shots, tight shots through canyon areas and strong winds. The back nine is a bit less extreme, but should not be taken lightly. When looking for Moorpark tee times, you should consider the reasonable Tierra Rejada Golf Club discounts. Reservations may be made online or by calling the course starter. Amenities include a full service practice facility, rental clubs, cart rental, pro shop and dining facility. Players proclaim Tierra Rejada requires a golfer to be accurate off the tee with good touch around the fast, contoured greens. The terrain makes this a challenging course.